The St. Mary Reservoir, near Cardston in southern Alberta, was built and filled by the early 1950s. During reservoir draw downs and droughts, lake bottom sediments are exposed and quickly eroded, which has revealed a unique collection of artifacts and even trackways of now extinct megafauna like mammoth and camel. Two particularly interesting artifacts are termed ‘eccentrics’ because their shape and significance are so unusual. Eccentrics are very rare artifacts, the shapes of which are thought to be determined more by aesthetic rather than functional reasons. 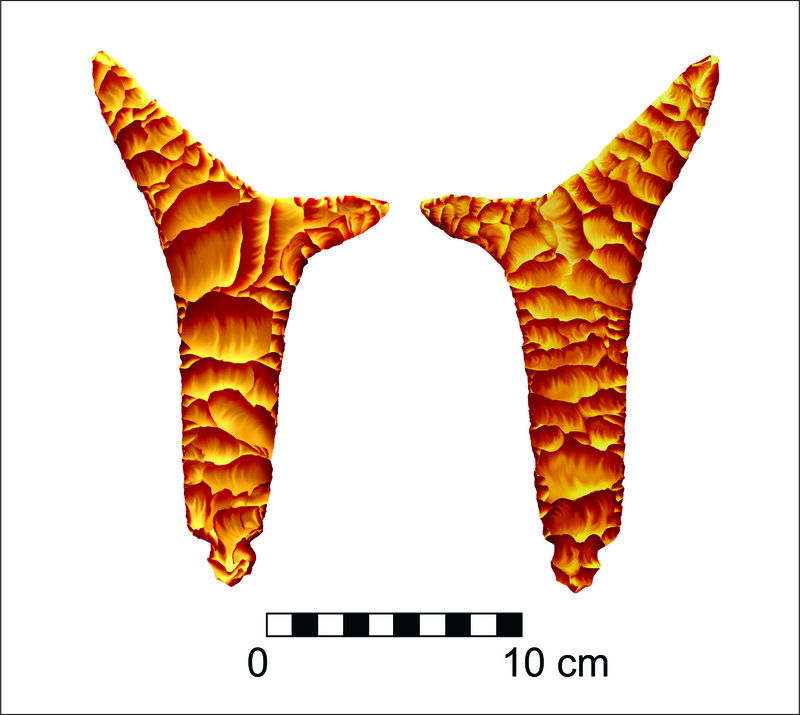 Some archaeologists think that the large flintknapped stone artifacts from St. Mary Reservoir are symbolic representations of the branched “horns” of pronghorn antelope once common across the Great Plains. Others think they may have been ceremonial knives used on special occasions. Knife River Flint ‘eccentrics’ from St. Mary Reservoir. The different colourations of these pieces are due to ‘patination’. This is when a chemical rind develops over time around particular edges or faces of artifacts depending on their exposure to different local conditions (courtesy of Shayne Tolman). The artifacts are made of a material called Knife River Flint, which outcrops almost 800 km away in North Dakota. Surprisingly, artifacts made of Knife River Flint are relatively common in Alberta, which archaeologists suggest is evidence of high human mobility and/or wide trade networks that spanned the Great Plains. 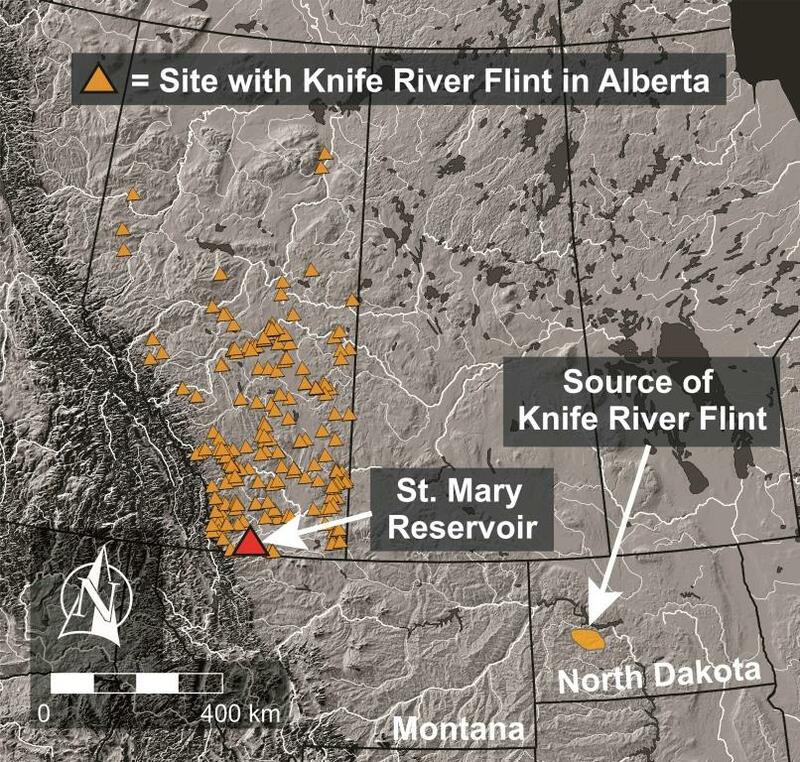 The abundance of Knife River Flint in Alberta has ebbed and flowed throughout pre-contact times and may relate to changing patterns of culture contact or movement. 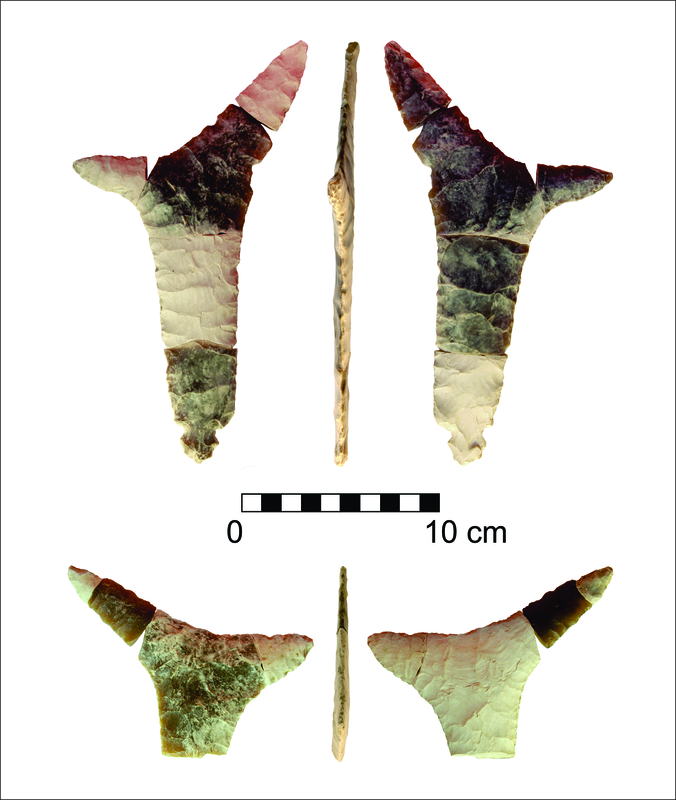 Knife River Flint spear heads have been found as far north as the Peace River area in northwest Alberta and near Fort McMurray in the northeast portion of the province. The occurrence of this exotic material heightens the importance and intrigue of the St. Mary Reservoir eccentrics. Map of St. Mary Reservoir and the Knife River Flint quarries in North Dakota. Alberta archaeologists have taken great interest in Knife River Flint and have studied techniques to accurately identify the material (including the use of UV light to produce a relatively distinct reflective pattern) and dynamics of weathering called patination. Shayne Tolman, who first discovered the eccentrics, is documenting links between time of exposure and degree of patination (the white rind that coats some artifacts) on Knife River Flint. Pieces of the St. Mary eccentrics are different colours because they rested in different positions and were exposed to different chemical weathering agents over thousands of years. Artistic reconstructions of what the Knife River Flint eccentrics looked like before they were broken and weathered (courtesy of Shayne Tolman). In my research on KRF in the past, I looked at many site reports, approximately 140+. None of these sites in Alberta, mentiones eccentrics. I found a knife river flint corner tanged knife last summer in Northeast North Dakota. I was wondering if there has been any corner tanged knives found in Alberta. Corner tanged knives are another unusual shaped artifact rarely found this far north. Thank you, I am enjoying your website immensely. I’m not familiar with any records of corner tanged knives in Alberta but I’ve seen a large ‘eared’ biface of Knife River Flint from near Innisfail that is similar in size (over 15 cm long) to some of the classic corner tanged knives of the US. Not sure why they don’t show up more in Alberta. Thanks for the question!